Even though he taught that Christ was the answer, he believed that Jews were blessed. We were drilled and tested on the Old and New Testaments. We kept the Sabbath in the purest sense... The kind of preacher he was — keeping the Sabbath and ignoring Christmas while everyone else was exchanging gifts — well, that separated us from the rest of the blacks, even the other Pentecostal black families. You should have seen the faces of the Jewish store owners in our neighborhood when we went to buy matzos for passover. But my own best guess, is that if you’re enough of a music obsessive to be reading this blog, and this post, in lieu of caroling, shopping, or chopping down Christmas trees, you already know all this. You know, too, about the old, African-American fascination with the Jewish people, and that White America was to Black America as Genesis-based narratives were to Exodus-based narratives. I’ve read books about this stuff, and still don’t know the first things. And another thing I don’t — or didn’t — know until recently, is that the Flamingos, who recorded one of the strangest and most beautiful rock and roll songs of the 1950s, were black Jews in the purest sense; which is to say, “Jewish” in ways that might have made your everyday Rabbi scratch his head and wonder. [That's a link; click it to learn more about Jews & Flamingos.] 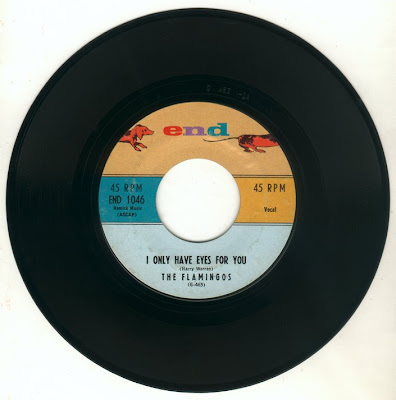 “Our harmonies were different because we dealt with a lot of minor chords which is how Jewish music is written,” one of the Flamingos recalled. And so forth. 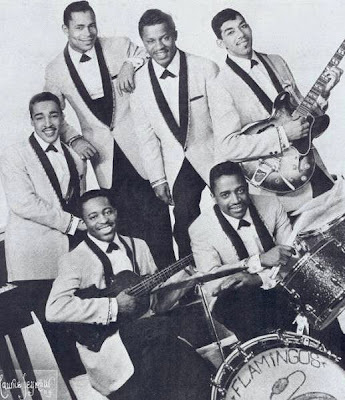 Or consider Motown's songwriters, who were instructed to stick firmly to the present tense, and to strip their lyrics of names and other specifics. Like Creedence Clearwater's American South, Motown's America is an entirely imagined place. In fact, Motown's America isn't America at all, but a mechanism — designed to deliver message like "Love stings," or "We're going to a Go-Go!" with maximum efficiency — just as John Fogerty's South isn't the South so much as an especially effective way of saying "Can it be that it was all so simple then?" If rock and roll's simplicity was only skin deep, then something that Lennon and McCartney had in common with Fogerty and Motown's staff of (divinely inspired songwriters) was the realization that a willful suppression of telling details creates illusions of specificity in the listener's imagination — and that the spaces a song leaves open tend fill up with details drawn from the listener's own, specific experience. As was often the case, Chuck Berry figured this out first. "The situation in the story was intended to have a wide scope of interest to the general public rather than a rare or particular incidental occurrence that would entreat the memory of only a few," he recalled. "Such a portrayal of popular or general situations and conditions in lyrics has always been my greatest objective in writing." "We wanted to reach everyone. Literally everyone," John Fogerty said in 1970. And, some years later: "When I would write a song like 'Who'll Stop The Rain,' I made it general and epochal. I tried to stretch it and make it bigger so that it wasn't just a song about me, so that lots of other people could look into the song and see themselves in it too. I did that on purpose. I was the opposite of someone like Joni Mitchell, who would write these very personal songs and then hope that everyone else would relate to it in that way, as if the person were them. I tended to make the song very broad and hope that lots of people would see it that way." And when songwriters gave situation-based narratives up for impressionism and the interior monologue, the first-person address became even more important — all there was to cling to — and at times, almost desperate: "Don't go back to Rockville," R.E.M. sang (in "Don't Go Back To Rockville"), or "I've been there and I know the way" (in "Can't Get There From Here). Or: "I saw your girlfriend/And she's eating her fingers like they're just another meal" (Pavement's "Summer Babe"). Or: "You can keep the furniture/Cut the kids in half/Release me" (Radiohead's "Morning Bell"). The first-person address alone accounts for the depths of feelings John Lennon summoned in the Beatles' most abstract and impressionistic song, "I Am The Eggman." "I'm crying," is the refrain here, and the way Lennon sings it, you believe him. But the song itself doesn't tell us much about Lennon's tears. Why is Lennon so sad? And if he is so sad, why does the song sound so caustic? If he's sorry, why does he sound angry? And if he's angry, why is he crying? The individual lines are well-honed and venomous, but so unconnected from one another that the song itself only begins to make sense when you trace its cries back to the first-person, present-tense refrain of "Ooh, Baby Baby," in which Smokey Robinson sang the same words — "I'm Crying" — in exactly the same way, thrice. "I'm crying," Robinson sang in Detroit, and far away in London Lennon answered him: "I'm crying," he sang. As you can see, my subject has gotten away from me. Too much eggnog after sundown last night, and not enough sleep this morning. But that’s the kind of morning I’m having: Jews and gentiles, Americans and Englishmen, songs and echoes, across the years and oceans, between the creeds and races. The too-much-feeling of things, squeezed through the narrowest of apertures — and, like the great Jewish-American novelist, Jonathan Safran Foer tells us, everything becomes illuminated. One thing I will say is that it often seems to me that, like so many other places, America isn’t any one place, that exists in any one time, but a great many places, nations, peoples, and times, that somehow manage to exist simultaneously. It’s a wonder we’re still here. And that my hope, this holiday season, is that the new year brings about a certain alignment of forces and energies, and a further blurring of the distinctions that keep us apart. That the synesthesia the Flamingos evoked so beautifully in the recording Ted’s posting today becomes manifest in our daily lives. That there’ll be no more distinctions here. Thanks for a wonderful post. The most important part of any work of art are the spaces. Wow. Just wow, and thanks for the beautiful thought provoking post.